Mitch Chang is an ukulele teacher, an event producer, and the brains behind the Los Angeles International Ukulele Festival. Mitch’s vision for the festival “is to make it as easy as possible for families and ukulele fans of all ages, interest, and ability levels to discover/rediscover the ukulele where they will be supported and encouraged,” and he delivers! It’s an all-day extravaganza of performances, workshops, and fun. I taught beginner’s workshops at this year’s festival, and I was so impressed by what I saw that I wanted to learn more about the man who made it all possible. Thank you, Mitch, for giving me a peek behind the scenes! Tell me a bit about your background. Born and raised in Hawaii, I got started on ukulele and piano before moving on to saxophone in junior high school and high school band. After the Army, I went back to school for pre-med and music but ended up choosing to focus on classical guitar at the University of Hawaii, which led to flamenco studies (my professor's professor was Pepe Romero) which brought me to California in 2000. How long have you been playing ukulele? Who are your musical influences? What style of music do you like to play? Ukulele was my first instrument around the age of 5. I think Hawaiian tunes and jazz tunes with an upright bass is the best fit for ukulele and this is my favorite style to play (on ukulele). I usually play solo finger style arrangements for gigs which stem from my classical training. Ukulele legend Lyle Ritz was a huge influence on me as I learned to put together my own solo arrangements and I’ve also learned a lot about style and swing from Bill Tapia, Benny Chong and Bryan Tolentino. Non-ukulele influences include musicians from the slack key guitar, flamenco and classical worlds like Keola Beamer, Sabicas, Christopher Parkening, just to name a few. How long have you been teaching? What drew you to teaching? I first started teaching when I was a starving college student, beginning guitar at the adult schools in Honolulu and ukulele at Pearl Harbor Community Center. You produce several events each year, including the Southern California Slack Key Festival, the Los Angeles International Flamenco Festival, and the Los Angeles International Ukulele Festival. What was the first concert/event you organized? How did it go? The very first concert I produced was a flamenco show in Hawaii in 1998 that featured performer friends from San Francisco; it was at the 300 seat Honolulu Academy of Arts theatre, and we completely sold out both nights! This emboldened me to move on to bigger and bigger venues like the Diamond Head Theatre (500 seats) and Hawaii Theatre (1,350 seats), all flamenco shows. What are some of the logistics you coordinate to put on such large scale events? What are 1-2 of the more challenging aspects of putting on a festival? Where do I start! Ticketing, printing, tenting, vendor and volunteer coordination, sound, scheduling, lodging for the artists, and so much more. The most challenging part, whether it’s a standalone concert or a festival, is to make sure the word gets out with effective promo and PR. People need to know about it! Can you walk me through the day of the ukulele festival, from your perspective? It’s basically making sure everything and everyone is where they should be when they’re supposed to be there, and everything is running as smoothly as possible to make it an enjoyable experience for everyone. I always end up with copious notes on how to improve things for the next year. What’s your favorite part of the festival? What have been some of your favorite moments from past festivals? My favorite part is seeing everyone having a good time, learning, participating and engaging with one another as well as with the artists. I love when people tell me how happy they were to discover something/someone new. Next year I’ll be opening up more space at the venue and adding more specialized kids and beginner classes/activities! Also Club Night the night before, giving more people a chance to get up onstage and play for others. Save the Date! 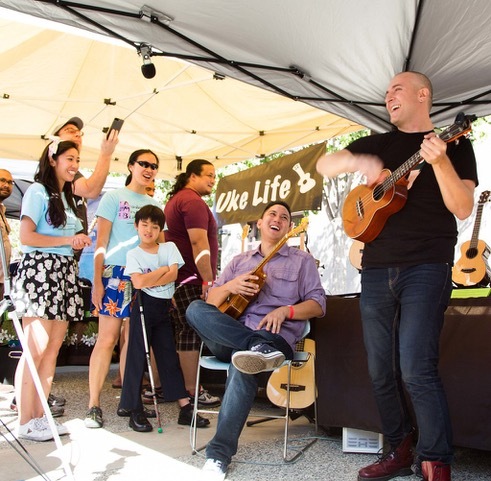 The fifth annual Los Angeles International Ukulele Festival will be held on September 28, 2019 at the Torrance Cultural Arts Center in Torrance, CA. See www.kalakoa.com for details.